Each mucosal fold contains large numbers of follicles of variable size that are separated by a thin connective tissue layer in which branches of interfollicular blood vessels ramify to supply the follicles. 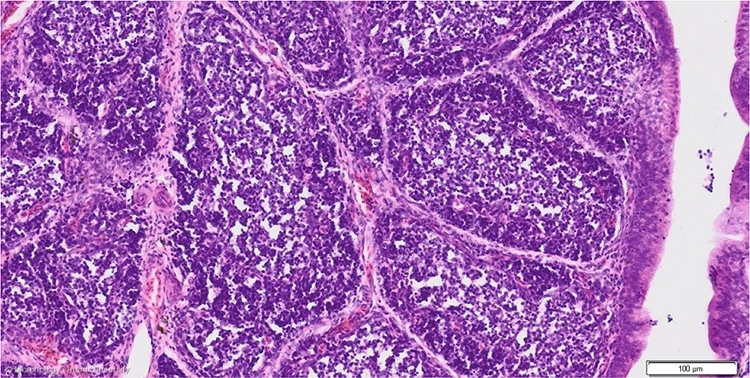 The follicles are composed of lymphoid tissue, B lymphocytes mainly, and can be divided into a darker staining outer cortex (pars lymphoreticularis) and a paler staining inner medulla (pars lymphoepithelialis). In ratites, the lymphoid tissue is not organized as follicles in mucosal folds but as lobules extending in the lumen on branches of connective tissue. These lobules have an everted structure: an outer pars lymphoepithelialis and an inner pars lymphoreticularis . Using the term â€˜medullaâ€™ for the outer pars lymphoepithelialis and â€˜cortexâ€™ for the inner pars lymphoreticularis would be confusing. NAA thus proposes to use the terms pars lymphoreticularis and pars lymphoepithelialis only.